Hell Creek Formation - South Dakota, U.S.A. Collected from the famous Hell Creek Formation of Northwestern U.S.A., this is a rare FINEST GRADE Triceratops tooth. Unlike most teeth usually found which are "spit teeth" or ones that were ejected from the dinosaur's mouth when alive, this one still has the root attached. The presence of a root indicates this tooth was in the Triceratops' jaw when it died. Rarely are Triceratops teeth found loose that have the full forked root as this one does. Furthermore, it is UN-ERUPTED so it never saw any wear or use which explains the perfectly preserved and complete cusp. This is an excellent educational specimen because the cusp on Triceratops teeth is very unique but most teeth found are fully or partly worn, making it impossible to see what the teeth originally looked like in the jaw as they formed and moved upward. A one-of-a-kind, gem of a tooth! No fossil tooth collection should be without at least one nice complete crown example tooth of one of the "household name" dinosaurs of America's Late Cretaceous. NO REPAIR AND NO RESTORATION. 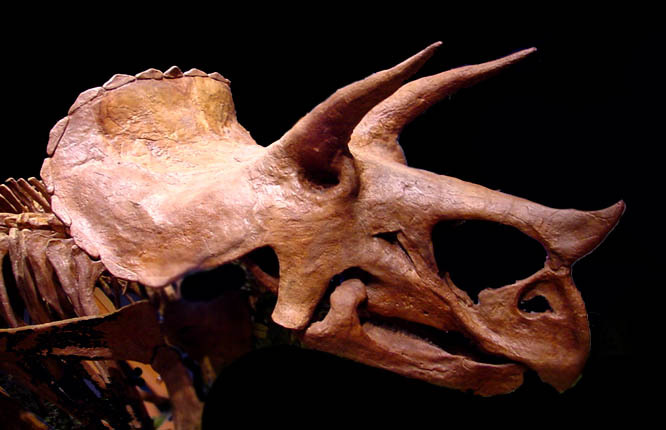 Triceratops is the most famous of the great horned dinosaurs. This plant-eating group has been found in the fossil record in greater abundance than all the other varieties. A full grown Triceratops is estimated to have weighed 11 tons, heavier than a modern African bull elephant. Its skull was 6.5 feet long with a pair of brow horns that exceeded 3 feet in length.